What Do You Know about Fayoum? The slogan of Fayoum consists of the Egyptian Flag and its eagle to express the governorate proud of belonging to the motherland. The slogan frame is yellow points to the desert which surrounds the land of the governorate. The green color in the ground points to the agriculture nature of Fayoum. Fayoum celebrates its national day on the fifteenth of March(15-3) every year. This day is the memory of resisting the English occupation during the 1919 revolution. 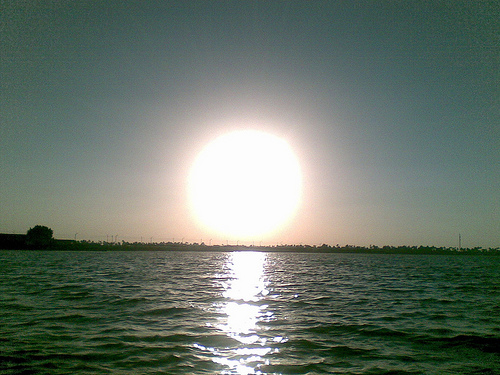 This day comes in the beginning of the spring when nature is perfect in Fayoum. The waterwheels are considered one of the most important features in Fayoum, as it is the only governorate in Egypt which enjoys this type of waterwheels. 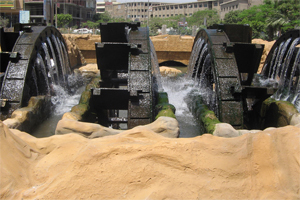 The waterwheels were based in the slogan of Fayoum due to its important role in irrigation and agriculture. Qaroun Lake is considered one of the most ancient natural monuments in the world. It was connected to the history of Fayoum since its construction when it was covering the whole region's area. Therefore the lake is an essential element in the slogan. Its year round moderate climate. Its site; 90 km from Cairo. Its monuments; Pharaonic, Greek-Roman, Coptic and Islamic. All combine to make Fayoum an exceptional destination to visit.